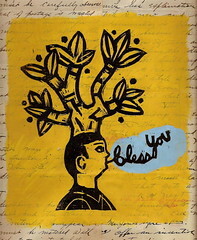 When some one sneezes and we say "bless you", usually I don't think it means much though it is a gracious gesture. But to say "bless you" or to pray for some one to be blessed can be very powerful. I have begun to reread the Prayer of Jabez book and I am being reminded of what blessing really means. In the book Wilkinson tells us that to be blessed means that God gives you favor. He encourages us to ask God to bless our life because this is what God wants to do and yet we need to ask to activate these good things God has waiting for us because as Jesus says, "We do not have because we do not ask". So following this reminder I have begun to ask God for his blessings to be released into my life and a very cool thing happened Saturday morning. The day before thanksgiving the frame of my glasses broke. I was able to keep wearing them but they were fragile. I finally made my way out to Kentwood where our optomitrist has his office on my bike to pick out some new glasses but didn't like anything they had to offer. I spent a long time in their catologs 'till I found something I liked which they then had to order. This meant another bike trip out for a fitting. After the second trip out to have the frames fitted I asked if they would be able to just send me my finnished glasses inorder to save me another long winter bike ride. They agreed for an extra $2. Well it was last Saturday and we had a family gathering to go to in Muskegon with a borrowed car and I still had not gotten my glasses in the mail. I mentioned to Brenda how I had hoped that my glasses would come today and about a half hour later there was some one at the door which turned out to be Dr Scholton our optomitrist with a small package. He said that he was in our neighborhood and thought he would just drop off my glasses. I was stunned. This small gracious gesture has stayed with me all week making feel blessed, letting me feel God's favor active in my life.